The top ranked high school player in the nation from the class of 2017 did not disappoint in his first (and only) season at Duke. Bagley was an excellent in college, racking up awards such as the ACC Player of the Year, 1st Team All-American, as well as being named as a finalist for the Naismith award. Playing alongside fellow stars Grayson Allen and Wendell Carter Jr., Bagley led Duke to a 29-8 record and a trip to the Elite Eight. Marvin Bagley ranks 7th overall in this year’s draft class with a PNSP of 83.2, which ranks behind fellow big men Jaren Jackson Jr (97.1), DeAndre Ayton (95.8), Wendell Carter Jr. (90.0), and Mohamad Bamba (84.2). Our Role Probability Models indicate that Bagley has a high floor, giving him an 86% chance of being at least an NBA starter (4th best among the 2018 class), and this year’s 5th highest All-Star probability at 38.6%. 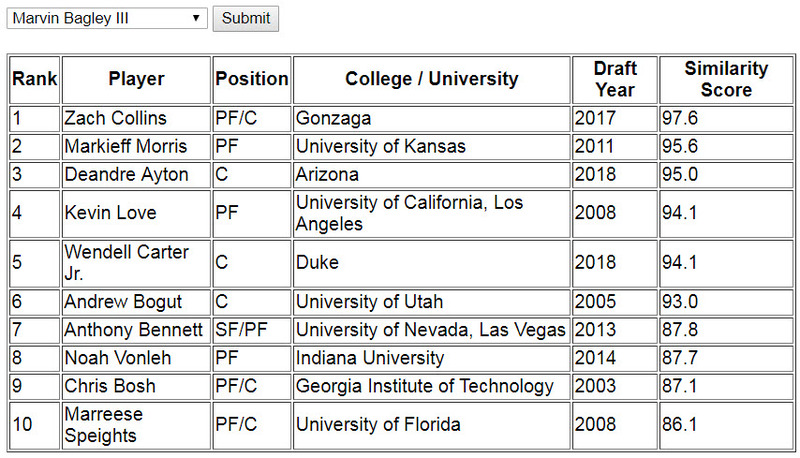 While nobody wants to be compared to Anthony Bennett, the rest of Marvin Bagley’s player comparisons from our Similarity Score Tool carved out a solid role in the NBA, or are highly regarded prospects. Most of them fit the bill of athletic big men, and many of them are average or better 3-point shooters. With the exception of Andrew Bogut, most of these players did not make their mark on the defensive side of the ball. Marvin Bagley flashed elite athleticism during his freshman year at Duke, showing an impressive combination of leaping ability, body control, and a quick-twitch burst that helped him excel in many aspects of the game. He showcased his leaping ability and body control in catching and finish lobs as a cutter and in rebounding – he snagged a team high 11.1 rebounds per game (ranking 9th in the NCAA). Bagley also performed well in fast break opportunities. He occasionally would high point a rebound and turn around to lead the break himself. Bagley also excelled at scoring in the paint by using his quickness. Although he is not as physically imposing as other big men such as Joel Embiid, DeAndre Ayton or Karl-Anthony Towns, he consistently used his quickness to get in position for a dunk or layup. Marvin Bagley clearly has the athleticism necessary to compete at the NBA level. Bagley made his mark on the offensive end of the court at Duke, and our models project him as a very strong scorer for an NBA big. He led Duke in scoring at 21 points per game, which is even more impressive given the fact that he played alongside an established star in Grayson Allen and fellow freshman standout Wendell Carter Jr. Bagley did most of his damage at the rim – according to hoop-math he took 57% of his shots at the rim and he converted an impressive 77% of those attempts. Bagley wasn’t just a finisher – he also showed the ability to create his own shot from the post or elbow. Bagley relied heavily on his dominant left hand in shooting at the rim. Even when moving to his right he would often twist his body in order to shoot with his left. This could be due to the fact that for most of his young career he was able to rely on athletic ability and was not pushed enough to develop his off hand. Improving his right handed shooting touch will be crucial in the NBA against bigger, more athletic competition. In his freshman year, Marvin Bagley displayed mixed results in his shooting ability. He attempted 58 three point shots and made just under 40% of them. While no one would suggest that he was an elite three point shooter in college, these are solid numbers for a young player who is still developing his shooting stroke. The bigger concern, however was his free throw shooting, as he shot just 62.7%. Historically, free throw shooting has been a strong predictor of three-point shooting in the NBA, which isn’t a great sign for Bagley’s potential as a floor stretcher. Below are some forwards and centers from recent drafts who shot less than 65% from the free throw line. Whichever team drafts Bagley will be hoping that his shooting development more closely follows the path of Al Horford rather then Terrance Jones or Montrez Harrell. By our models, Bagley does project as an above average three-point shooter for an NBA big man. Given his height and leaping ability, Marvin Bagley was surprisingly poor at blocking shots at the college level. He averaged less than 1 block per game, and posted a block percentage of just 2.6%. Therefore, it is no surprise that our models project him as a very poor shot blocker in the NBA. Bagley also posted a very pedestrian 1.4% steel percentage in college which is further evidence of his lack of production on defense. An outside factor that could be influencing these low numbers is the fact that Duke was a very poor defensive team and played zone for much of the year. Zone defenses do not produce steels at a high rate and can incentive opponents to shoot more perimeter shots. However, I think we can safely say that Bagley does not project to be an effective rim protector in the NBA. Perhaps more important than his shot blocking will be how well Bagley can move his feet and play defense on the perimeter. He was not asked to do this very much at Duke but it is an increasingly important skill for NBA bigs. If Bagley can be competent in switching onto smaller agile wing players he will be far less of a liability on defense. Marvin Bagley will make his mark in the NBA on the offensive end where he possesses the skills to be an effective scorer. To reach his full offensive potential, he will need to continue to develop his free throw shooting and outside shot. If he can eventually shoot as effectively as his elite player comparisons Kevin Love or Chris Bosh, he will be a very difficult match up as a forward/small-ball center. On the other side of the floor, Bagley will struggle to anchor a defense and protect the rim. If he can at least challenge shots and develop his mobility as a perimeter defender, he could develop into a serviceable defender.